This is Eden's Painted Fern (Fern). 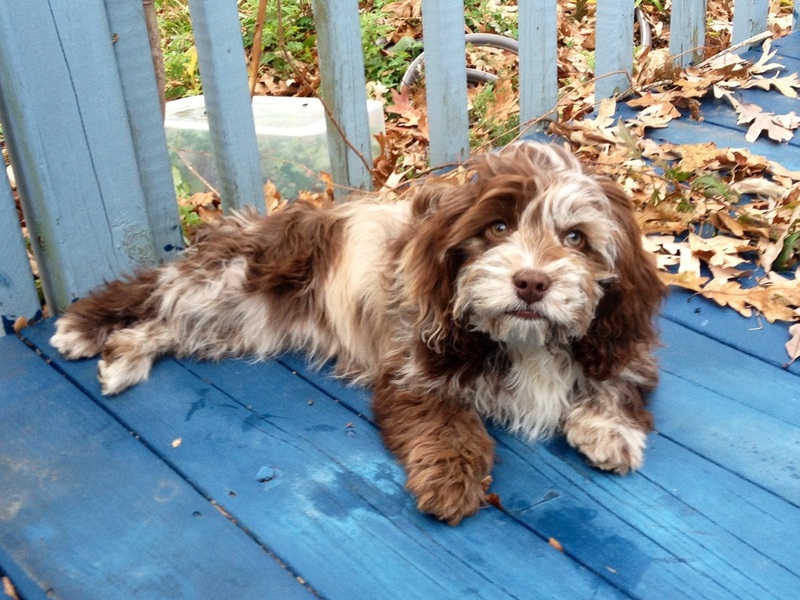 She is a chocolate merle with gorgeous green eyes and lovely white markings. Fern is a very gentle and sweet dog who wishes nothing more than to be near her people. Fern is bright and exceedingly sweet. She is as gentle a soul as I have met. Fern whelped a litter of 7 in 2013 and all her babies are beautiful and wonderful additions to the homes they are now living in. Fern has proven to be an exemplary Mama dog, nurturing her puppies with delicate care. She is very particular and goes to great lengths to ensure her puppies are in an environment that meets all her very strict standards. 2014: Fern is retired and living in the Sunny South with her very loving, very wonderful new family. I made the decision to retire Fern (who is now called Abbey - and suits her lovely name very well) because two of her seven puppies are shy with strangers. It is not a trait I prefer, despite it being quite common in Cockapoos. This trait is not one that makes a "bad" dog however I breed first and foremost for therapy and service animals, who must be extremely outgoing and confident in lots of new situations and with a constant influx of strange, new people. Fern's babies are beautiful and all of them make excellent companion dogs. Retiring Fern was a difficult (and expensive) decision and is one of the reasons that breeding can be exceedingly difficult and emotional! It was, however, the right thing to do for the future of Cockapoos as therapy and all-around perfect family dogs (in my humble opinion). It is hard to find a new home for a dog that is part of your family, however for a breeding program to be functional (and practical) it must be done. We feel very fortunate that our little girl is in such a wonderful home, with such a loving couple that I am proud to call them my friends. She will be a very well-loved and spoiled only-dog and what more could I ever want for one of my babies?